Adam had grand plans when it came to proposing to Molly—and he abandoned each and every one of them the second he picked up her engagement ring. “He ran the mile and a half home from work, burst open the door and—sweating and out of breath—got down on one knee and proposed,” Molly says. 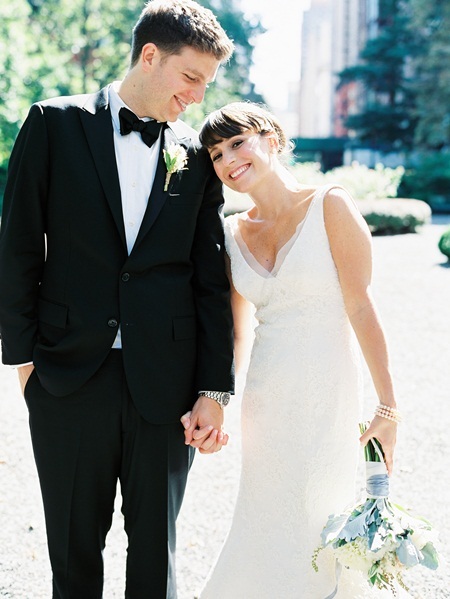 The couple wed with the same enviable spontaneity, taking just 10 weeks to plan their August elopement at the iconic Gramercy Park Hotel. “The hotel is in our neighborhood, and has always been one of our favorite, local spots. It has a look and feel that we have always loved,” Molly says. Read and see it at brides.com. This entry was posted in Uncategorized and tagged Gramercy Park Hotel, New York City, Real Weddings. Football Fans Get Married While Tailgating! What’s the purpose of an engagement party?